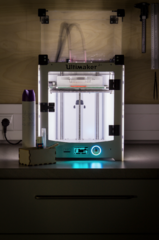 I'm quite new so please don't blame me, but I'm into deep problems with the Ultimaker 2+ in our FabLab (Bad Windsheim, Germany). The axle-rods (the thinner ones that go through the printhead) tend to get loose from the black plastic mounts and then knock on the acrylic side of the case. This furthermore causes another huge problem: Sometimes the rods fail to touch the end switches after printing and when homing the printhead. -> ERROR: X/Y-switch broken. The printhead can be moved with a small but consistent resistance. However, print quality isn't affected at all. I'd be glad if anyone could help me out! Maybe somebody out there has encountered similar problems or knows somebody who has. I'm happy about any tips and suggestions! If you need (detailed) pictures of the printer to help me out, please let me know. This is more common on UM3 but has never happened to me on UM2. Maybe that can hold the rods in better for you. Also maybe you got oil or grease where they connect to the block. Maybe remove the rods, clean with wd40 and wipe very clean and dry. These don't need much oil - almost zero. The thinner rods go through the head with ball bearings. So you don't want much oil on these. The larger diameter rods in the gantry do need oil. I'll definitely try that out! Looks like those caps could hold them in place. I'll report the results. Thank you! I've already thought of that - problem is, that those axles haven't seen a drop of oil since they got replaced with polymer bearings - which were to be ruined if they got lubed. Even cleaned them of with acetone in advance to re-installing. When I switched to polymer bearings I also had the same problem - typically this was caused by the polymer bearings binding and as a result moving the black blocks backwards and forwards, usually resulting in the shorter rod working its way forward until it fell out of the printer. I would imagine both could work equally well for you. I'm not 100% sold on using polymer bushings as they do have a habit of binding, but they are quieter and for the moment are working well for me with the block clips. I've also seen this problem in the very beginning, but I made a shim of "post it labels" (cut exactly to fit) and this is what I'm using in my printer. It never come loose anymore. You may select a type of paper with less thickness, this to avoid to hi tension, as this can make the black sliding unit to crack -like it's seen on some of the first generation UM3.